To prepare the dough combine all the ingredients in a bowl and knead into a semi soft dough using water. Keep it for 5 – 7 minutes. Divide the dough into 12 equal parts and keep them covered under a wet muslin cloth. For the onion filling heat oil in a pan. Add the kalonji, saunf, bay leaves, green chillies and onions and saute till the onions turn light brownin color. Add the besan, coriander powder, chilli powder, garam masala and salt and saute for 2-3 minutes. Divide into 12 equal parts and keep aside. 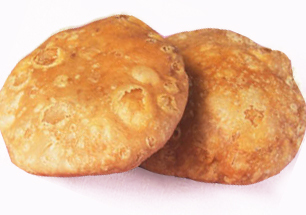 To make kachoris roll out each portion of the dough into a 2 inch diameter circle. Place one portion of the filling in the centre of the rolled dough. Surround the filling with the dough by slowly streching it over the filling. Seal the ends tightly and remove excess dough. Roll each filled portion into a 2 1/2 inch diameter circle taking care to ensure that the filling does not spill out. Gently press the centre of the kachori with your thumb. Deep fry the kachoris in hot oil over a slow flame till fgolden brown. The kachoris should puff up like puris. These kachoris take a long time to be cooked in the inside too.